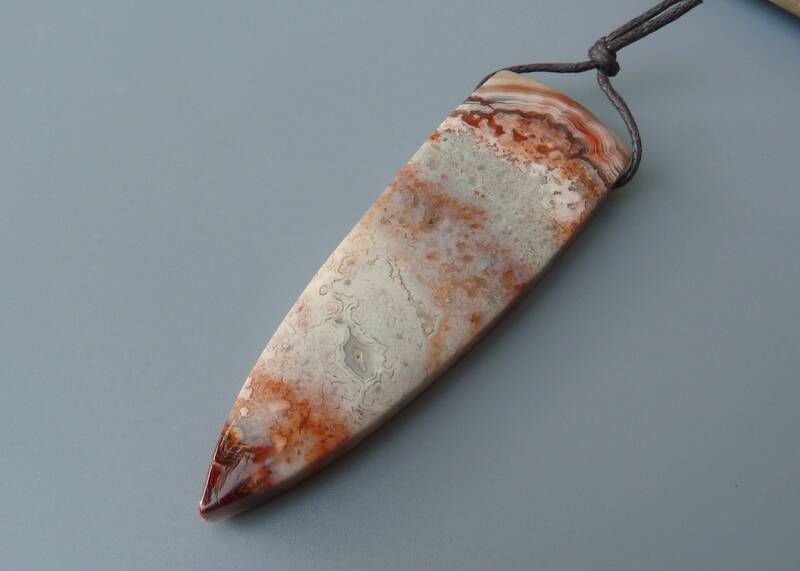 This listing is for one Laguna Lace agate teardrop shaped top drilled pendant. The colors in this exquisite gemstone bead includes dark red orange, light orange, gray, and white. The back side in the fourth picture is just a pretty as the front. The pendant has a slightly domed top and flat back like a cabochon. Laguna Lace Agate is one of the most highly sought after banded agates in the world. It is known for its extremely tight banding and vibrant shades of red and scarlet. Laguna Lace Agate is mostly found in the remote mountain range of Chihuahua, Mexico. This agate is a variety of banded chalcedony quartz. It's layers may contain shades of deep red, milky white, gray, yellow, gold and brown. The metaphysical properties of Laguna Agate provide steady and vibrant energy that stimulates a zest for living. Like most agate, it promotes inner stability, composure, and maturity. And its protective properties encourage security and self-confidence.